Good morning! Hope you're all more awake than me today, lol! I stayed up late last night working on a project and dealing with nuisance bears (mom and cub) tearing apart my garbage can/garbage. From about 10:30 PM- 11:30 PM I watched/yelled at them. Unfortunately, they weren't really all that concerned with me. So my poor husband had to clean up the mess this morning before work. And then my 2-year old was up at his usual 6:00 AM time...and I could really use more sleep. This layout was inspired by Maya Angelou's "I Know Why The Caged Bird Sings". My sweet little girl is already such a free spirit, always happy, endlessly sweet. 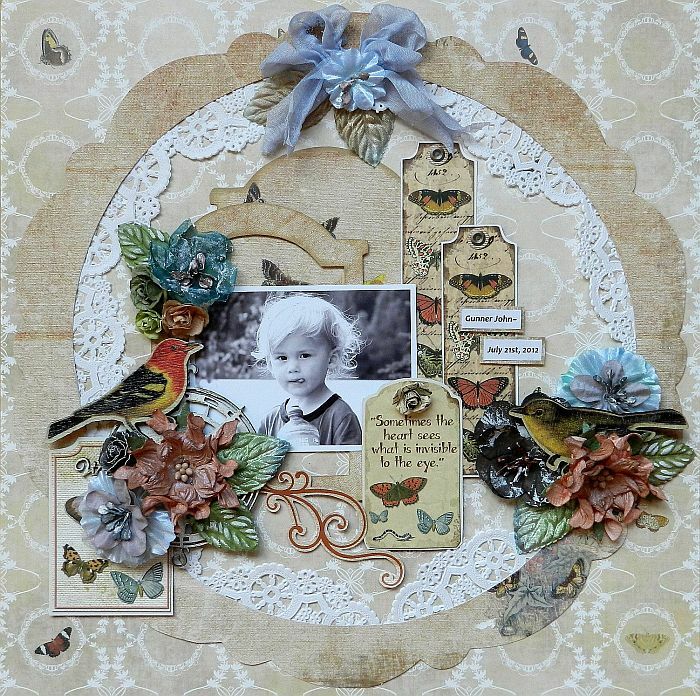 So naturally I used the "bird" elements in this kit, including the paper, bird cage, and wooden embellishment. I had a lot of fun playing with the background, adding layers of masking with texture paste topped off with embossing powder, and the Lindy's Stamp Gang mist provided in the main kit. I wanted to create something playful and fun, just like my little Aspen . Thank-you so much for stopping in! If you love the look of this kit, be sure to check out the September section of the store HERE, where you can purchase the kit, add-ons, and individual items :). Fantastic! You can do nearly monochromatic like none other! I love the even tone of all the details in the first page. And that card, well whoever receives that will have their day made! Wauw, your work is beautiful. Fabulous layouts - think the second just stole my heart though and your card is gorgeous! Wow, you did such amazing work with this kit! I always love the soft and shabby chic feel to everything you create. Really beautiful layouts and card! 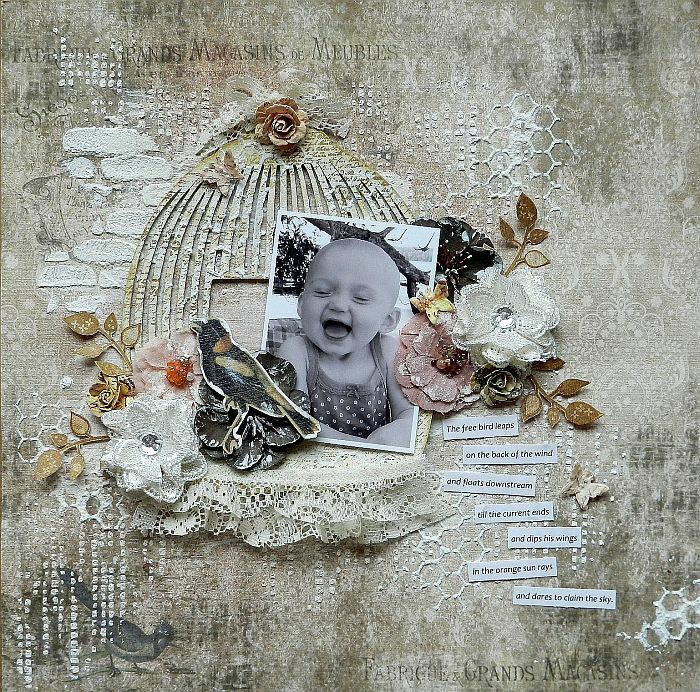 Love the mixed media on your 1st project with the pretty flowers.Great pic too. 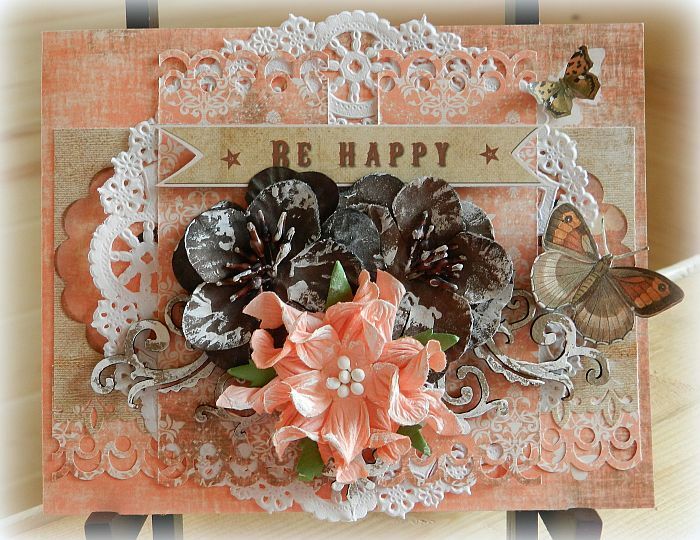 Love the colors of the flowers & the butterfly tags on your 2nd project.Nice bright peachy color on your card. Great Job on all! HI.. these are magnificent.. so many details..absolutely gorgeous photos, and the card looks amazing too.. and I hope you can sort out the bears.. that sounds scary!! very beautiful as with all your creations!! stunning!! Amazing work! Love your texture and your style is so elegant! OH! MY! GOODNESS ME Erin... Those 2 layouts are ABSOLUTELY POSITIVELY STUNNING!! The Details in both of these are SUPERB!! & How SUPER CUTE is that photo of Aspen!!! More beauty! You never disappoint! I've been without internet for almost two weeks and missed seeing your and Kelly's beautiful creations. Playing catchup this morning. Love that first page- the gesso stencil work is amazing and your daughter is SUCH a cutie! My Lola just started growing hair about 8 months ago so your photos always make me smile. Beautiful projects on this post- always the perfect amount of detail and great color combos!